Plans for a new high-speed rail network, featuring 250mph trains, have been announced by Transport Secretary Lord Adonis. 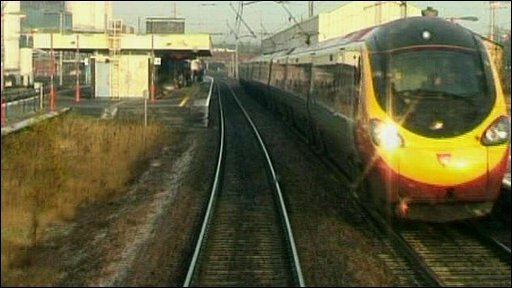 The government is recommending a route for a new line between London and Birmingham with a future extension to northern England and Scotland. The public will be consulted on the proposed route, with work unlikely to start until 2017 at the earliest. Network Rail said high-speed rail "can drive economic growth and boost jobs". Lord Adonis told the House of Lords that the views of communities along the route would be particularly sought. Faster travel, but at what cost? "Subject to this consultation, the London terminus for the high-speed line would be Euston, the Birmingham city centre station would be at Curzon Street, and there would be interchange stations with Crossrail west of Paddington and near Birmingham airport." The preferred route will run out through north-west London, skirting to the south-west of Aylesbury, then to the west of Buckingham and the east of Brackley and Banbury, before passing between Leamington Spa and Coventry and running into the eastern side of Birmingham. A future extension is being considered to northern England, which would run in a Y shape with one branch to Sheffield and Leeds and the other to Liverpool and Manchester. Lord Adonis said the project would create 10,000 jobs and yield £2 in benefits for every £1 spent. He said the first 120 miles between London and the West Midlands would cost between £15.8bn and £17.4bn. The cost per mile beyond Birmingham is then estimated to halve, taking the overall cost of the 335 mile Y-shaped network to about £30bn. The main opposition parties are also committed, in principle, to the need for a high-speed rail network. However, reaching the necessary political consensus for a particular route may prove to be difficult ahead of the general election. Shadow transport secretary Theresa Villiers said the Conservatives were not prepared to "blindly accept" the route proposed by ministers. She added that if the Conservatives are elected to power, they would start work on the project in 2015 - two years earlier than the government's plan. Scotland's Transport Minister Stewart Stevenson said developing high speed rail to Scotland "is central to the economic case for high-speed rail in the UK". Network Rail chief executive Iain Coucher said high-speed rail was "a vital part of a modern, dynamic economy". He also said that it would "take cars and lorries off the road, cut domestic flights and release capacity on the existing rail network, transforming services even for those communities not served directly by a high-speed line. "It is the low-carbon, sustainable transport of the future." Michael Roberts, chief executive of the Association of Train Operating Companies (Atoc), said: "The commitment that all three parties have shown to HSR [high-speed rail] is a vote of confidence in the industry, and will help place train travel at the heart of a successful low-carbon economy. "The plans must be affordable at a time of real constraint in the public finances and must show how HSR will be paid for while continuing to invest in the existing network on which passengers make more than a billion journeys a year." For the past year, the government-backed company High Speed Two has been working on plans to develop a new high-speed rail network, initially between London and Birmingham. The new line could cut the journey time between the cities to just 46 minutes. Bob Crow, general secretary of the RMT union, said: "We welcome any move to expand the rail network and to bring more passengers on to the trains. "However, development of HSR in the UK has been left in the slow lane because of our fragmented, privatised system which puts short-term profits first and long-term, strategic planning a very poor second." Patrick Begg, director for the National Trust's Thames and Solent region, said the proposed route could cause "serious and significant impacts on the landscape" of the Chilterns. He added: "We're taking a keen interest in how these impacts have been considered and assessed, particularly exploring the government's proposals for mitigating against these impacts through design and tunnelling. "Like many people, we're yet to be convinced that the overall business case for HS2 - the high-speed line - stacks up environmentally, financially and socially." Geraldine Nicholson, the chairwoman of No Third Runway Action Group (NoTRAG), which is opposed to Heathrow Airport expansion, said: "If the government thought it was going to get plaudits from us for its plans, it is sorely mistaken. "What we want to see is an HSR scheme that goes all the way to Scotland, a scheme that is designed to make it easy for people to use the train instead of the plane. "We will oppose any scheme that does not involve the dropping of the third runway." Anthony Smith, Passenger Focus chief executive, said he welcomed "the commitment that the new line will be an addition to the current network - not a bolt-on rich man's railway". He added: "The ability to turn up and travel remains a key attraction of Britain's railway. This new line, with fast frequent services could, with attractive fares, start to revolutionise intercity rail travel."